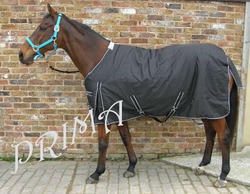 Our product range includes a wide range of horse turnout rug and horse turnout rain rug. Sizes available : 5'0" to 7'0"
We welcome all your trade related inquiry. Packaging Details: Standard Export Packing. Packed in Corrugated boxes. 1.We can provide Rain sheets with Neck and detachable neck option on order.